Fig. 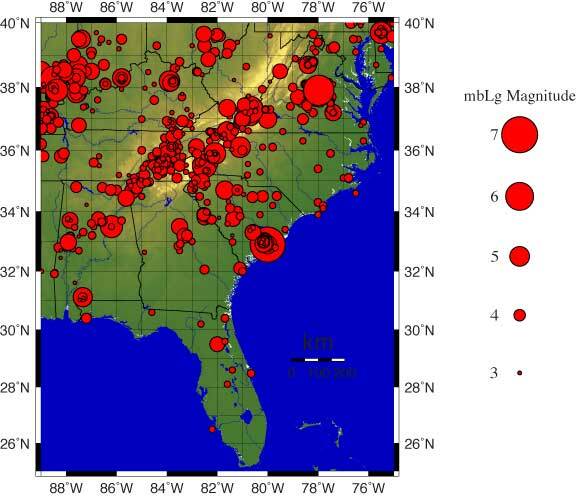 1: History of earthquakes large enough to be felt (greater than magnitude 3) in the eastern United States. These earthquakes are all examples of intraplate earthquakes. Most students who have ever taken an earth science course learn that earthquakes occur when two tectonic plates interact with each other, which can happen when two plates collide (subduction zone), as two plates slide past each other (transform fault), or as the plates rift apart (rift zone). Japan and Chile each sit near subduction zones, which have created the largest earthquakes in written history. The San Andreas Fault Zone of California is a transform fault zone that can trigger large earthquakes up and down the state. The deadly 2009 earthquake in L'Aquila, Italy was an example of an earthquake in a rift zone. But what about earthquakes that occur in the center of a continent? In the United States, a large earthquake tore down building in the late 1800 in Charleston, SC; the Eastern Tennessee Seismic Zone sees atleast a thousand small earthquakes each year; and the largest earthquake in the continental U.S. occurred along the New Madrid fault near St. Louis, Missouri in the early 1800s. These earthquakes in the center of tectonic plates are known as intraplate earthquakes, and every earthquake in the map shown here of the eastern United States is an example of an intraplate earthquake. The New Madrid earthquake was one of the largest in U.S. history, but large, deadly, intraplate earthquakes have also occurred in China, India and Spain, just to name a few. If interactions between different tectonic plates trigger earthquakes at the plate boundaries, then what causes earthquakes within the center of a plate? As tectonic plates have collided and moved around the earth, they've broken up and reformed. What was once a plate boundary or a mountain range may now, on the surface, be nothing more than gentle rolling hills -- like those in Appalachia. However, beneath the surface are remnants of those ancient faults and tectonic plates. When these ancient faults are triggered, an earthquake occurs. Most intraplate earthquakes are small, though occasionally they can get quite large. The two questions nagging seismologists today are: 1) What triggers these ancient faults, and 2) How can we predict where, when and how large one of these earthquakes will be? These are the questions we're trying to answer at the Virginia Tech Seismological Observatory. The region of Charleston, South Carolina has a rich history of seismic activity. The Charleston earthquake of 1886 was one of the largest shocks to occur on the eastern coast of North America. The geological cause has long been a controversial issue and a variety of source models have been proposed. A new, testable hypothesis concerning the fault source of the 1886 shock is very different from all previous interpretations, and is based on data collected in 2011 and 2012. This new deployment of 8 seismic stations by Virginia Tech was designed to collect data for more accurate hypocenter locations and focal mechanisms. Results from the study include locations of 134 earthquakes located using Hypoellipse (Lahr, 1999), with 87 of those made even more precise using the double difference location method implemented by the program HypoDD (Waldhauser and Ellsworth, 2000). The hypothesis proposed in this study is as follows: The 1886 shock occurred by compressional reactivation of a major, south-striking, west-dipping early Mesozoic extensional fault, and the modern seismicity can be regarded as a long-term aftershock sequence that is outlining the 1886 damage zone. This hypothesis can be readily tested by the deployment of a denser station network in conjunction with a longer monitoring period.